From left to right: Professor Yoel Sasson; Professor Shlomo Magdassi; Yael Amit; Ambassador Yael Rubinstein, Professor David Engelberg, Professor Isaiah Arkin. The Singapore-HUJ Alliance for Research and Enterprise (SHARE), marked its launch on September 19 with a special event attended by university leaders, diplomats and researchers from both Singapore and Israel. SHARE is a new research and innovation centre of the Hebrew University of Jerusalem, located in Singapore. This is the first HUJ centre outside of Israel and marks a refocus of the university’s international strategy towards Asia. SHARE came into existence following Singapore Prime Minister, Lee Hsien Loong’s historic visit to Israel in April 2016. The first stop on this visit was the Hebrew University of Jerusalem, where PM Lee received an honorary doctorate and witnessed the signing of MOUs to advance research collaboration between the two countries. This led to the establishment of SHARE, which will serve as a hub for research, scholarship, entrepreneurships and postgraduate training and add to Singapore’s already vibrant R&D ecosystem. The launch event opened with Professor Low Teck Seng, Chief Executive Officer of the National Research Foundation, who welcomed SHARE as the newest member of the Campus for Research Excellence and Technological Enterprise (CREATE). CREATE was established as an international research hub to develop long-term institutional partnerships between Singapore and world-leading universities. Prof Low spoke of the long history between the Hebrew University of Jerusalem and Singapore, and expressed his desire to see the partnership grow under SHARE. Guest of Honor, Ambassador Yael Rubinstein, Israel’s ambassador to Singapore, spoke of her personal history with the Hebrew University where she earned two degrees. She emphasized the importance of academic collaboration and the excellent researchers which both Singapore and HUJ produce. In addition, guests heard from Professor Isaiah Arkin, VP of HUJ for Research and Development, about various areas of HUJ’s excellence and successful examples of commercialization, including breakthrough technologies in computing, agriculture and biomedicine. Finally, participants viewed two presentations on the SHARE research projects. The project on “nanomaterials for innovative manufacturing,” a joint collaboration with Nanyang Technological University, led by Professors Lee Pooi See (NTU) and Shlomo Magdassi (HUJ). This project offers promising technology in the field of printed energy devices, such as solar cells and batteries, and smart windows. 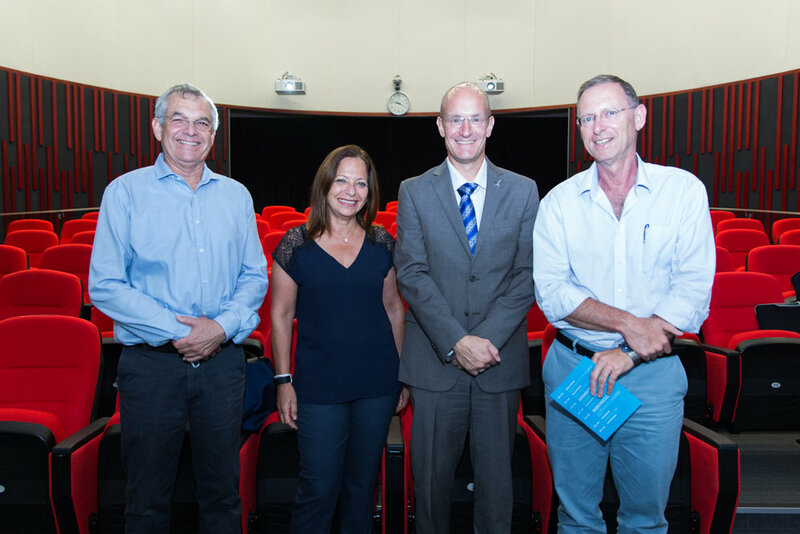 The second presentation showcased the SHARE project in “integrative approach for deciphering and treating chronic inflammatory diseases”, a joint collaboration with National University of Singapore, led by Paul MacAry (NUS) and Professor Ehud Razin (HUJ). This project has already made promising steps in diagnostic and therapeutic avenues for chronic inflammatory diseases. Professor Yoel Sasson, Director of SHARE, a Hebrew University researcher based in Singapore to lead the centre, concluded the event with inspiring remarks for the future success of SHARE. Sasson’s vision is to create real value for Singapore through increased research collaborations which will provide solutions to global problems. HUJ’s first international research centre in Asia is sure to grow from strength to strength.